We’ve talked many times before about how you can use double capacity filing cabinets for storing office supplies and records. They’re great because they spin to open and close, offering as much storage space as three lateral file cabinets. But…did you know there are many other uses for these innovative cabinets? Well, keep reading and you will! But first, here is an explanation of how the cabinets work. The cabinets revolve 360 degrees to give you double deep, two-sided storage. 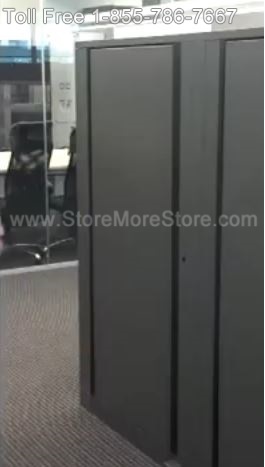 There are four sides to the cabinet: two for storage and two panels to close/lock the cabinet. To access stored items, simply depress the foot pedal located on the bottom right side and gently push to spin the cabinet. When you release the cabinet’s foot pedal it will automatically stop spinning in either the open or closed position. Pretty much every elementary, middle, and high school has a nurse on-site. And the nurses have a lot of things to store and organize: student records, prescription medications, medical supplies, personal items, and much more. But there isn’t a lot of space. That’s why the double capacity filing cabinets are so great. They’ll store everything, and as a bonus, the cabinets lock up tight to prevent unauthorized access. Schools, universities, professional orchestras, and church choirs all store sheet music and instruments. And most have had a hard time finding a good storage option. Well, not anymore. 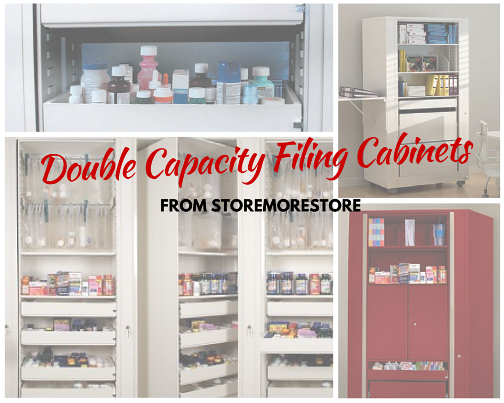 With double capacity filing cabinets you’ll gain the ability to provide extra storage capacity, easy access, better organization, and increased security. 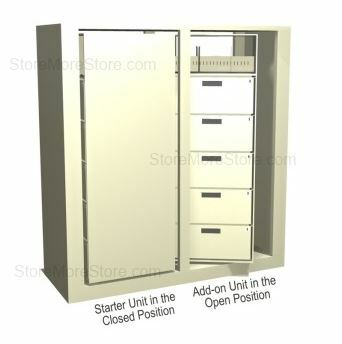 Double capacity filing cabinets store parts and tools efficiently and in a small footprint. 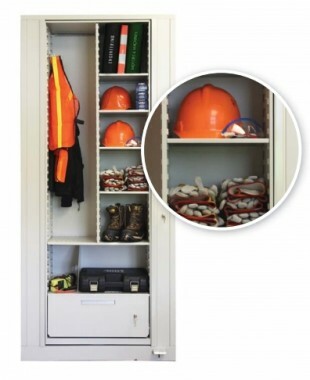 These industrial cabinets offer a unique way for your business to store important manufacturing materials and shop tools close at hand. The cabinets have numerous accessory options including bins and drawers, which makes them a great choice for small parts and tools. 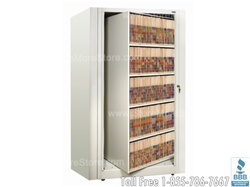 You’ll find a wide variety of size options for double capacity filing cabinets from us online at StoreMoreStore. And if you don’t see what you’re looking for or need some assistance, please don’t hesitate to give us a call at 1-855-786-7667. 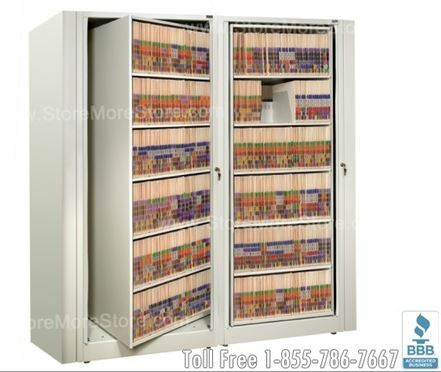 Are you looking for a better way to store your files, supplies, boxes, and binders in one secure cabinet? Then spinning rotary storage cabinets are the perfect solution for you because they rotate around to save you time, space, and money. 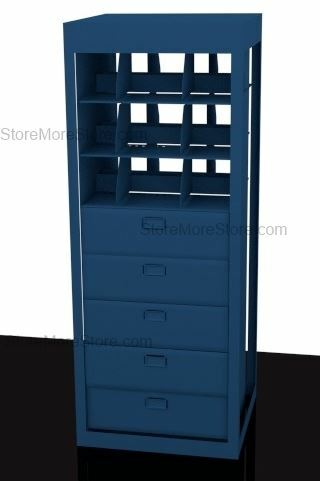 These rotating filing cabinets are available from StoreMoreStore fully assembled with free shipping! 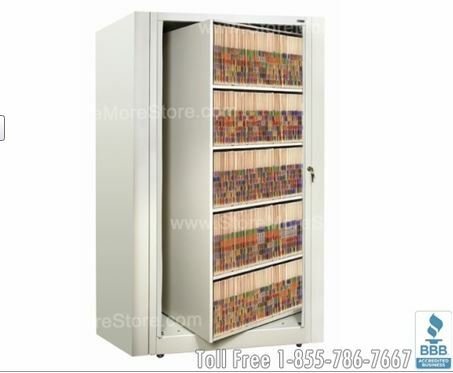 Our rotary filing cabinets are available in 19 different colors at no extra charge. 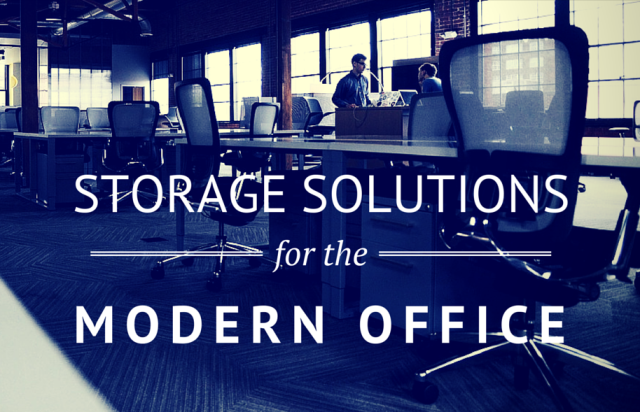 You can personalize your rotary storage unit for what looks best in your office. 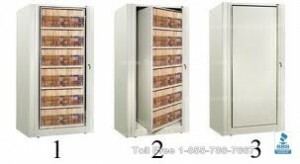 If you are looking to personalize your rotary storage system even further, just give us a call toll free at 1-855-786-7667 and we can add any of the optional accessories you need like file drawers, pull-out work shelves, small media drawers, and more. 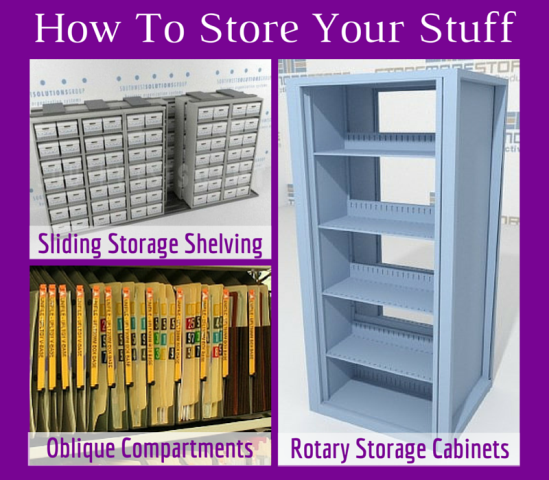 Also, check out the chart above to see how much more you can store in less floor space with two times the storage of rotary cabinets versus traditional vertical and lateral filing cabinets. • Dual Side Access– The revolving 360° rotation makes the cabinet accessible from either side providing twice the storage. This makes rotary cabinets the perfect room divider. 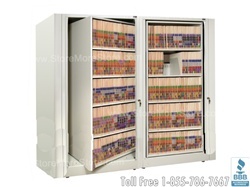 • Multimedia Storage– Adjustable shelves can be used to store letter, legal, binder, and book media. • Security– The unit can be locked in the open or closed position, which works well for HIPAA compliant records storage applications. • Easy Expansion– Both side panels of the unit are removable for easy expansion to either side as more storage is needed. 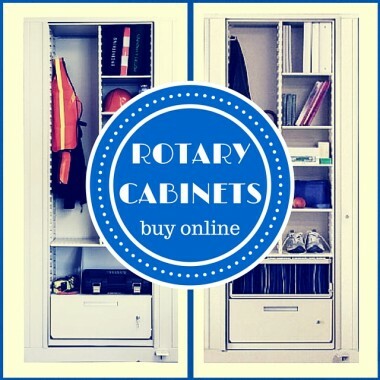 Get your fully assembled rotary cabinet from StoreMoreStore today to take advantage of our free shipping offer! Call us toll free at 1-855-786-7667.